UPDATED: Mon., June 18, 2018, 3:31 p.m.
Would it be too much to ask that the highest-paid employee at Washington State University have an 8-year-old’s understanding of what constitutes a fact? Or, failing that, would it be too much to wish that WSU, the institution that finances Mike Leach’s football team, help him learn how to separate a lie from the truth? The poor, bedraggled, forgotten truth? Maybe so. Maybe the truth, like fiscal discipline, is something WSU has given up for football. 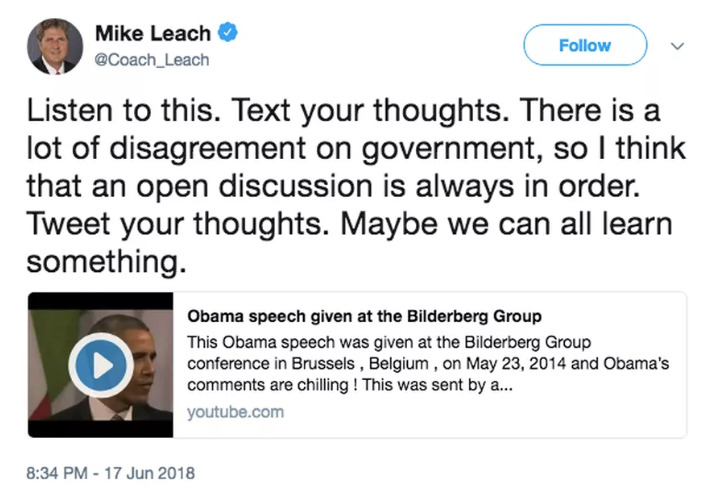 On Father’s Day, Leach went Trumpy on Twitter: Posting an obvious hoax video about President Obama and insisting in an extended back-and-forth that facts are just whatever someone says they are. Facts are matters of opinion. Just whatever dumb thing pops out of your mouth. Who’s to say different? What’s a fact, indeed? A slogan for the times. Maybe Leach’s employer (enabler?) could help him answer that question. Maybe there’s a course that Leach could take in critical thinking. Something remedial. In the meantime, the university could stand up clearly and without reservation for facts – for those fusty, old-fashioned units of verifiable truth. Instead, it issued a milquetoast statement noting only that Leach is a private citizen expressing an opinion; on the most important question, it remained silent. It’s an incredibly obvious hoax. Anyone associated with a college in any way – anyone who ever just drove past a college once on their way to a football game – should be able to tell it’s a lie. Leach can’t, though. He was peddling a hoax, not an opinion. He was telling a lie, or falling for one, and justifying it by muddying the waters. In response, he asked: Who can tell what’s a fact? Universities can. Second to football, you might argue that handling facts is one of a university’s main jobs. But, showing the same gelatinous backbone it has with athletic overspending, WSU has issued a cowardly dodge about Leach’s Twitter stupidity. Tell that to private citizen Robert Wielgus, the wolf researcher who WSU publically rebuked and silenced over research that legislators from ranch country didn’t like. WSU recently paid Wielgus $300,000 to settle a lawsuit claiming it had infringed upon his academic freedom. But so long as it’s just the football coach out there peddling nonsense, well then, NBD for WSU. We’re in a terrible predicament now, based on widespread failures of critical thinking. Lies fly from the president’s mouth by the second – a stream of obvious, easily disproven lies – and are gobbled up as truth by a distressingly large number of Americans. That’s one problem, and it’s a doozy. But it would remain just one corner of our politics if it weren’t for the large outer ring of enablers – those who minimize, divert, engage in the what-about-Obama game, stay cautiously silent on the congressional sidelines, and complain continually about media bias as a way to soften the factual landscape for invasion. Pretty soon, you’ve got people acting like the whole idea of the truth is silly. This is on full display now as the Trump administration separates hundreds of kids from parents who come here seeking asylum. What’s happening is clear and obvious, if you sail by the lights of the fact: journalism, video evidence, firsthand accounts, corroborated reports from independent sources. The administration made a choice, announced its choice on television, and started doing what it chose to do, to the horror of every decent American. The lying that has followed has been incredible, even by current standards. Every form of dishonesty in the political rainbow has been deployed. The president blames the minority party, a direct, obvious lie. Cabinet officials either cite the Bible in defense or deny the truth outright. The credulous house media nibbles on the edges of the truth, stopping short of full lies while focusing on side issues and technicalities and attempts to turn it all into a both-sides problem. There are so many different claims out there now – so many different “facts” – that someone who doesn’t understand or care about facts might well believe anything. It’s a living satire of democracy. A tower of babble. A nation inoculated against facts by the strength of attitude: Sez who? What’s a fact? If Leach doesn’t know, WSU should tell him. Updated: June 18, 2018, 3:31 p.m.